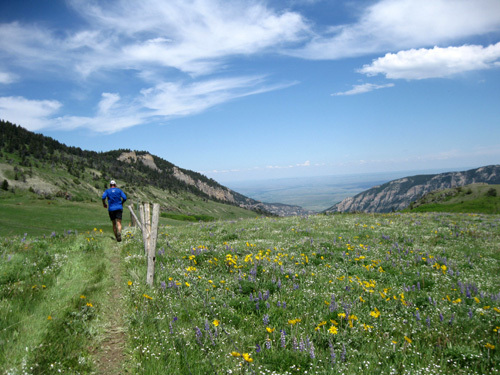 the conjoining Bighorn Mountain Wild and Scenic Trail Runs." Jim and I well remember the inaugural year of the Bighorn 100 in 2002 when race staff seriously underestimated the difficulty of the course. The 31-hour time limit and accompanying interim cut-offs resulted in a low 24% finishing rate. Jim was one of the 28 runners out of 37 starters who DNF'd that year. Only nine finishers! The runners enjoyed the course but clearly let it be known that more time was needed to realistically finish it. 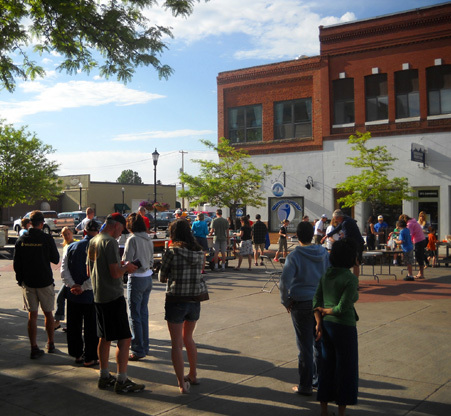 The race has had a higher finish rate since the time limit was extended to 34 hours and the number of entrants has grown to about 177 this year (as of the June 8 list on the website). A runner descends toward the Tongue River Canyon in the 2009 Bighorn race. At the awards ceremony one of the race staff corrected the number of Bighorn 100 races that have been held -- this was the 9th year for the race, not the 10th. I'm betting there will be some special features to commemorate #10 next year. 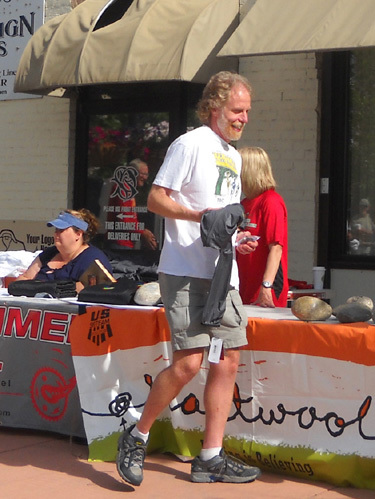 Note that no one has finished all nine Bighorn 100s, although I think Les Mignery has finished eight of them. 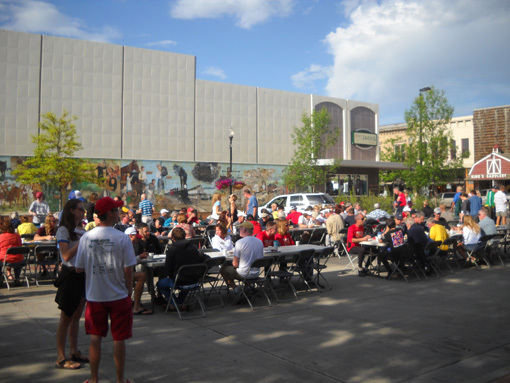 Everyone involved with the race is invited to come enjoy a free pancake breakfast served up by the Kiwanis Club, then listen as the 52-mile and 100-mile finishers are called up to receive their awards and congratulations by announcer Wendell Robison (himself a frequent Bighorn 100-mile finisher) and co-RDs Karen Powers, her daughter Michelle Maneval, and her sister Cheryl Sinclair. Even though the 30K and 50K awards are presented at Scott Park in Dayton on Saturday afternoon, runners from those races may also come to the breakfast and awards ceremony on Sunday morning if they are still in the area. 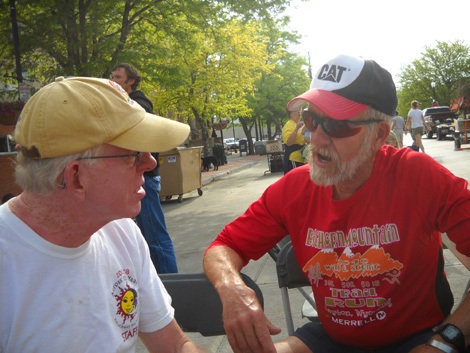 This is a great time to socialize with friends, hear race "war stories," (thankfully no one was challenged by a moose this year like Karl Meltzer was last year! 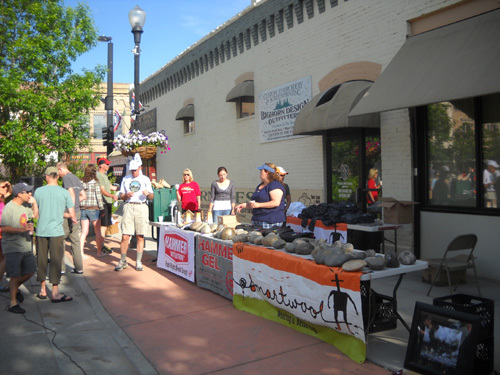 ), cheer on the finishers as they receive their awards, and maybe even win a random door prize. 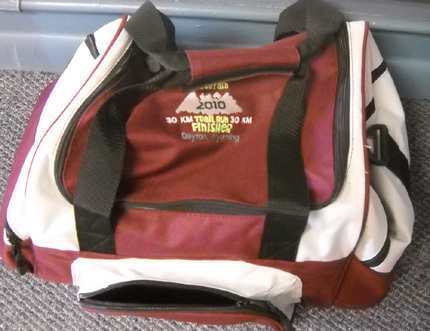 Volunteers and runners may put their names into the box to be drawn for various items. I lucked out and won a nice pair of Smartwool socks. 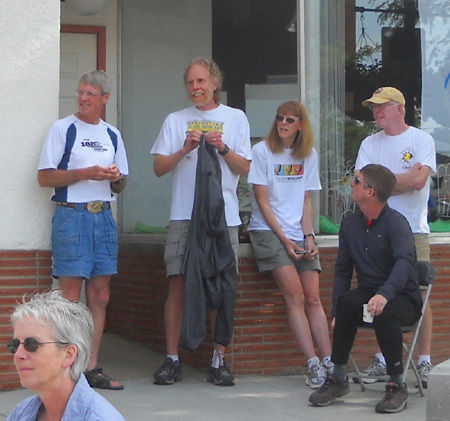 This was our last chance to talk with some of our ultra running friends for a while, although some we'll see at North Fork, Hardrock, Leadville, and maybe the Grand Teton races, Silverton 24-Hour, or Bear 100 if Jim decides to do any of those races. Rich is the guy who spurred Jim on to a faster finish than he expected yesterday. They placed 1-2 in the M60-69 age group in the 50K. Gene is a multiple "50 States and DC" finisher, often running 50Ks instead of "just" marathons. He travels around the country doing marathons and ultras nearly every weekend -- sometimes even two per weekend. He's 75 years young and as sweet as can be. Note that Gene also finds time to volunteer at races, too. 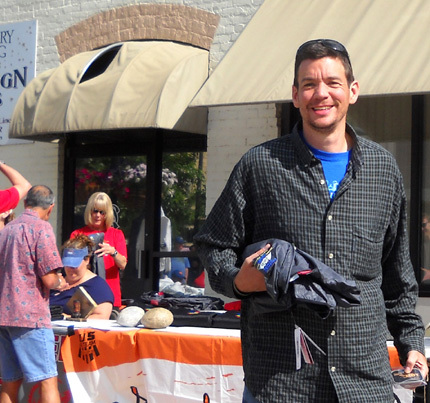 The last two years we've worked bag stuffing and packet pick-up with him at Bighorn. He and I shared some miles on the trail during the 50K last year, too -- both great ways to get to know your fellow runners better. Bob is the father of one of our good ultra buddies, Tom Hayes. Both live in Montana. We've known the Hayes family for many years. Bob is now 83 years old but still cranks out quality ultra performances. When he was "only" 80 or 81 he ran the 50-mile LeGrizz race in an amazing time of about 10� hours! Try that when you're 80 years old!!! Bob was courageous enough this year to enter the Bighorn 52-mile race with its challenging time limit. He missed a cut-off and wasn't able to finish, but with enough time he sure would have. He's tough and he's more fit than the majority of men in this country who are half his age. all sought shade during the awards ceremony. Bob related an interesting story to me this morning. He knows I ran/hiked the Appalachian Trail, so he knew I'd like this: Back in 1947 (I think he said) he was working at Sherburne Pass in Vermont at a fire tower when Earl Schaefer came through and signed his guest log. The pass is at or near the intersection where the AT goes east and the Long Trail goes north (they run contiguously for a bunch of miles south of there). Bob didn't realize until ten years later that Earl was the first AT thru-hiker. Cool! I enjoyed hearing that story. 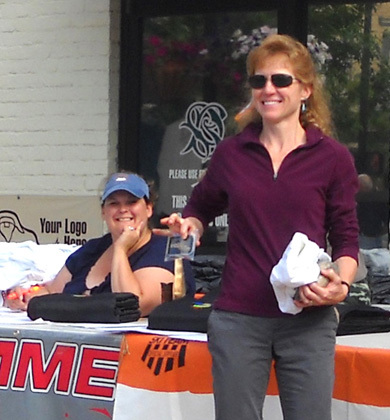 Although 52- and 100-mile runners received part of their awards when they finished on Saturday, there were lots more goodies to give out today and the runners' efforts were publicly acknowledged. 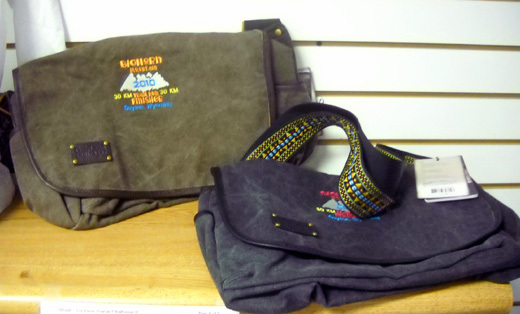 We have always received very attractive, useful finisher awards at Bighorn: fleece vests, jackets, sports bags. We still wear or use them from 'way back in the late 1990s! This year's finisher awards are also attractive and useful. I'll start with the 30K and work my way up the the 100-mile awards. Women could choose their color preference. Women received white jackets in both those races and men got navy ones. Jim really likes his (so do I -- wish I had one, too). 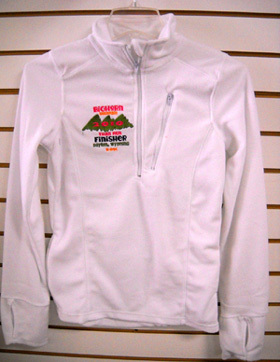 Hundred-milers get even more good stuff than the other runners when they finish Bighorn. 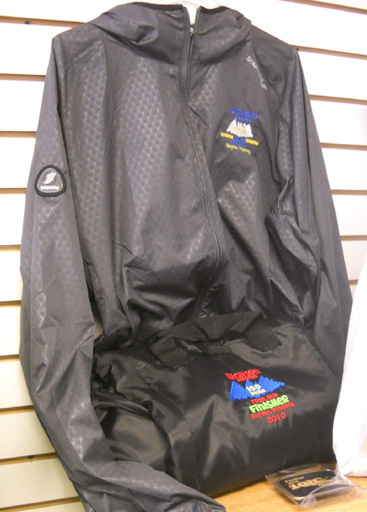 When they crossed the finish line, they received a reversible nylon-and-fleece blanket to keep warm. At this morning's ceremony they also received practical all-weather running jackets and handsome gold and black belt buckles. 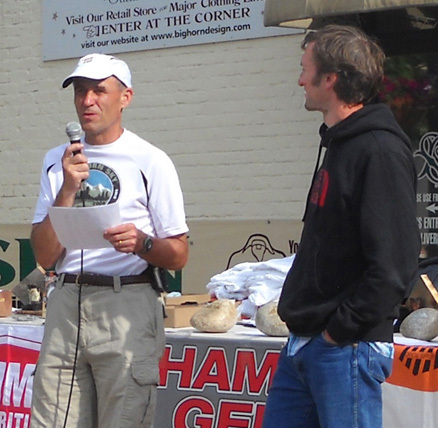 In addition to the above garments and other awards, age group winners three-deep in ten-year age categories in all four races received handsome Bighorn Mountain rock awards like the one Jim got. 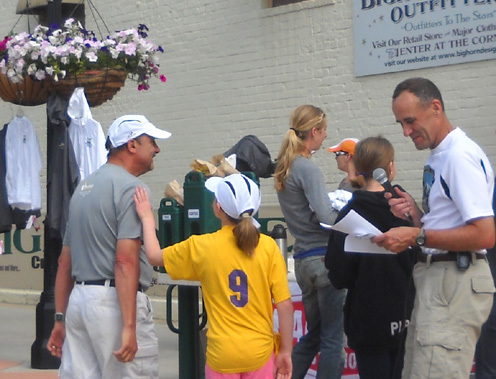 I believe that the overall male and female in the 100-mile race received monetary awards (gift certificates?) and/or framed pictures; I'm not sure what the overall male and female won in the 52-mile race. 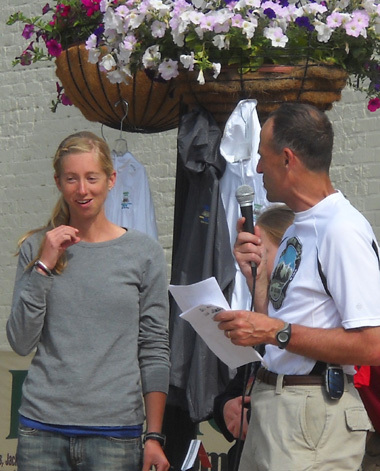 At the beginning of today's ceremony, the 52-miler age group and overall winners were recognized. One hundred twenty-eight runners completed the difficult course within the 15-hour time limit; another three are listed in the results but finished over the time limit. I don't know how many began this race or what the finish rate was. I do know there were 217 entrants on the list a couple weeks before the race. 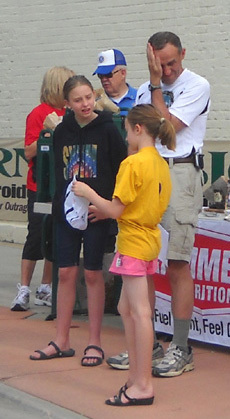 The first overall 52-mile finisher was Kevin Koch in a time of 8:25:08. Helen Lavin finished 5th overall and was the first female to finish. Her time was 9:42:59. 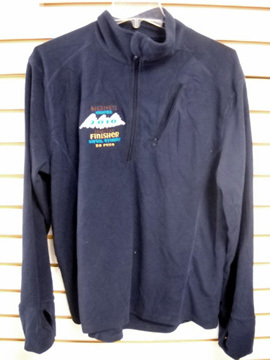 I see that both Helen and Kevin are wearing their comfy fleece finishers' jackets in the photo above. Karen is wearing this year's 100-mile entrants' shirt. Wendell has on the nice ball cap that all the 100-milers got in their entry bags (the women's hat has purple inserts instead of black). 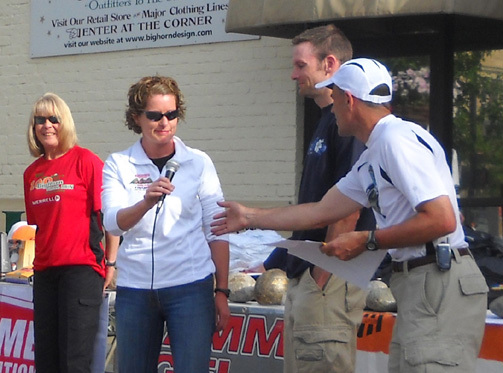 After the 52-mile overall and age group winners were recognized, the 100-milers were the focus of the awards ceremony. Each one was called up front to receive their jacket, buckle, and rock, if they placed in their age group. Wasatch has its Crimson Cheetahs. Bighorn has its equivalent, the Rusty Spur Club -- all those runners who have broken the magic 24-hour mark in the nine-year history of the Bighorn 100. There were thirteen of 'em this year. Some, like Jeff, have also won the honor previously. Race staff will get the rusty spur awards engraved and mail them to this year's recipients. There were 95 official 100-mile finishers this year who made the interim cut-offs and came in under the final 34-hour cut-off. That's a 61% finish rate. One young man in the 19-and-under category finished. 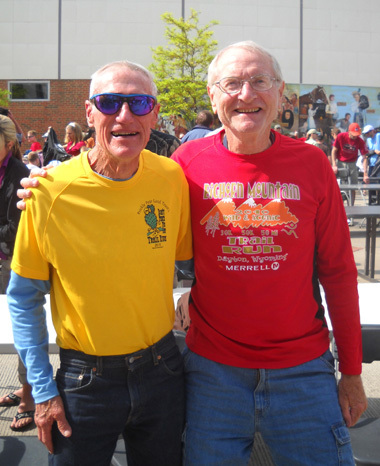 Only two men over 60 finished (Dave Westlake and Ernest Stolen, age 63 and 61, respectively). No women over 60 finished (I'm not sure any were even entered). Only two women over 50 finished (Susan Gebhart, 55, and Kelly Ridgway, 52). This is not an easy race for older men and women to finish! Neither is the 52-miler. Wendell introduces 100-mile winner Mike Wolfe. This year's 100-mile winner was 32-year-old Mike Wolfe from Helena, MT with a new course-record time of 18:43:37 -- despite the adverse course conditions and re-route near Porcupine because of the snow. He beat his nearest competitor, Joseph Grant, by over an hour, and bested Karl Meltzer's 19:18-hour time from last year. Wendell teasing Ashley Nordell for sleeping late this morning . . .
with a personal best 100-miler of 27:30:41. 10th place in the M50-59 age group (very competitive age group!). Before the awards ceremony began, Michelle asked each of the six runners, who have known Wendell for many years, to give a short personal story about him. They had about half an hour's notice to come up with something interesting. You can see how moved Wendell was by the time Jim spoke (next two photos). Jim was last, which made it tougher to come up with remarks that hadn't already been made! 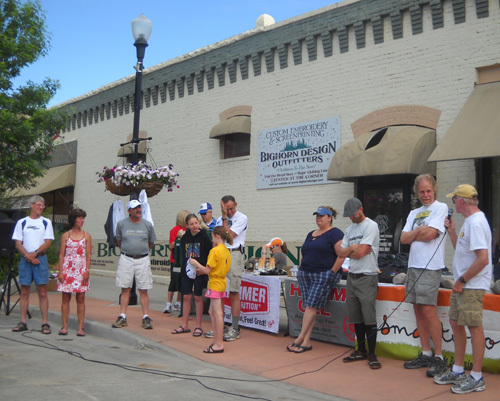 After the tribute to Wendell, the second half of the 100-miler finishers were called up for their awards. as he goes up to receive his finisher's award. Mike James gives me a big smile! I hate it when races end and everyone goes home except the locals. Fortunately, we'll see some of our friends at other races this summer, fall, and winter. 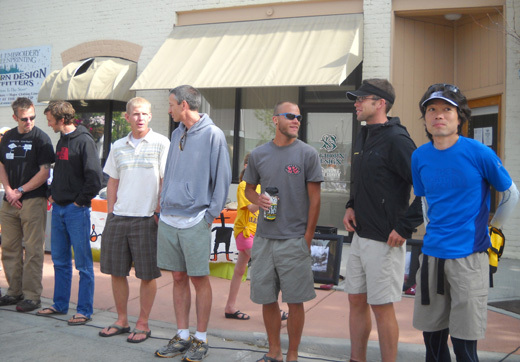 Some we probably won't see until next year's Bighorn race. The awards ceremony was over by 10:15 AM and folks gradually dispersed. Jim filled out a SASE to receive next year's entry early (the shorter races fill up FAST) and we went over to the Sports Stop to look for a couple items. After doing five loads of laundry in Sheridan (that didn't include the load of towels we forgot), we headed back to the Foothills Campground in Dayton. The place had transformed itself back to the Foothills we're accustomed to in the weeks prior to the race -- nearly everyone was gone! That was another sign that it was almost time for us to leave the Bighorns, too. Sometime I'd really like to come back and see what the mountains look like later in the summer and fall . . . 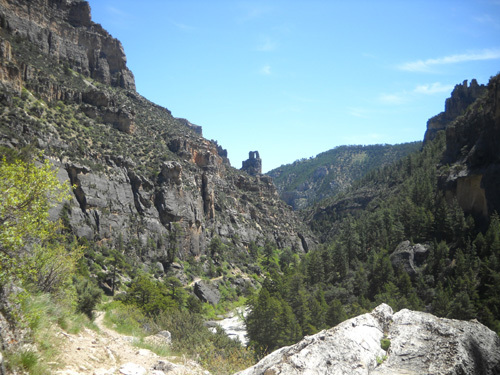 Trail through the Tongue River Canyon, with only six or seven miles to go in the races. 1) Jim's glad he was in the 50K this time; he had FUN even though he pushed hard. He needs to get the fun factor back in his races and training. 2) There were times during the last couple weeks while we've been in the area that I wished I was in the 50K or 30K race but I know it's not in my best interest because of my bum knees. If I could find a flatter or uphill trail race with such a generous time limit, I might do it. The Bighorn races all have too much serious downhill for my knees. This morning during the breakfast and the awards ceremony it was sunny. In fact, I don't remember any year when the Sunday morning ceremony has had poor weather. 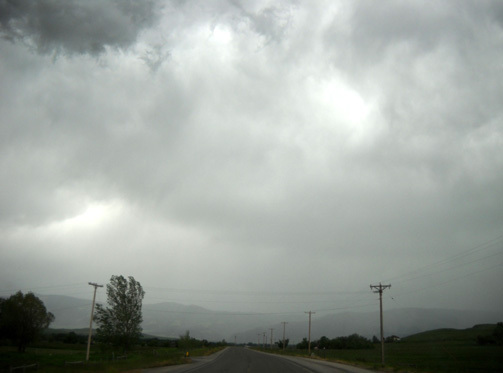 This afternoon the Bighorn foothills, including Sheridan and Dayton, had a nasty storm. In our campground it blew down tree limbs and knocked a huge cottonwood tree onto the roof of a house just across the street (the boulevard all the runners go down before entering Scott Park for the race finish). We could hear chain saws running all afternoon and evening. Some large branches came down in the campground where, only a few hours before, runners' campers and tents had stood. It's a good thing they all left when they did. Fortunately, we didn't sustain any damage to our truck or camper but our site was a mess and we were surrounded by puddles of water. We hope we can get the Cameo out tomorrow when we plan to leave. Storms hit fast and furiously in the Bighorn Mountains and foothills. This is a photo I took on June 16 as we were heading back to the campground in Dayton, WY. Besides baseball-sized hail (BASEBALL-sized??) and torrential, flooding rain, a tornado hovered over the Metra stadium/concert venue for about 15 minutes. Local TV stations played an amateur video tape of the tornado over and over, graphically showing debris flying in every direction. Apparently there wasn't too much damage in residential areas, so we are hoping that all of our friends and Jim's family members who live there are safe. You just never know . . . We have dodged a lot of weather bullets in our travels the last few years. One of these days our luck just might run out.